Challenge 2000 founder Kitty McKinley was presented with a korowai woven by Maori living on the Whanganui river in a moving moment during the pinnacle of 21st birthday celebrations on Saturday night October 10. The Maori cloak acknowledged Kitty’s and Challenge’s contribution to the lives of thousands of young people. Kitty started Challenge in 1989 as a one-year experiment to addresss the problem of young people who were not succeeding in the education system. The weekend encompassed a wine and cheese cocktail party on Friday night at which patrons were highly entertained by comedian Gary McCormick, donating his time, workshops on the Saturday, a dinner on Saturday night and a Mass on Sunday. 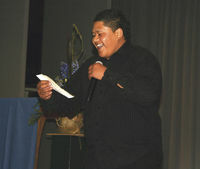 Challenge talent was showcased during at least one event with Meyer Peteli almost succeeding in upstaging the main talent on Friday night with his witty emcee-ing of the cocktail party’s entertainment. Challenge 2000 runs a school for people who have for some reason dropped out of the education system ultimately encouraging them back to school.